West Cottage is a unique 3 bedroom cottage nestled in the outstandingly beautiful surroundings of the Seven Heads, West Cork. The cottage sleeps 7 people and if extra room is needed our Coach House can be rented. An open plan sitting room & kitchen downstairs is floored with rustic slate and beautiful rugs & overlooks the a stunning vista of rolling West Cork countryside. Kitchen contains all mod cons and cooking utensils. Next to this is a double bedroom with a window leading outside into the herb garden. Upstairs to the left is the second bedroom which contains both double and single beds. From here a small stone balcony has steps leading down into the garden and overlooking the rolling hills and Maloney’s beach. Along the corridor upstairs is a bathroom including both a bath and a shower. Beside this lies the master bedroom which has a a breathtaking view of the surrounding hillsides. All double beds are king size & the duvets & pillows are all feather & down. For those who can’t totally embrace the seclusion of wild West Cork, we have WIFI set up in the cottage free of charge so you can keep in touch with the outside world! Breakfast / Lunch / Dinner are all available, just ask Gilly for more information & pricing! We use our own organically minded, fresh produce from our garden & locally sourced meat to create some utterly delicious food. All allergies & dietary requirements can be catered to. Or, If you'd just prefer dinner, a delicious 3 course meal with locally reared meat & vegetables plucked straight from our organically minded garden is €30 per person. We can serve food in the comfort of the Cottage. You can save a fortune on restaurant-priced wine by drinking your own bottles at dinner! For sample menus, photos & reviews check our FB page by searching for Dunworley Cottage. For extra accommodation we also have a coach house (VRBO Listing 42688) which sleeps three and has one bedroom on a balcony overlooking the sitting room which has a single bed in it. It also has a bathroom and a kitchen with all the necessary appliances in it. This can be booked at an extra cost. Dunworley is on the breathtaking Seven Heads Peninsula, part of the Wild Atlantic Way route. A sandy tidal beach lies just a moment's walk away and offers a tranquil swim, a rugged coastline climb, or just a wander around the beach. 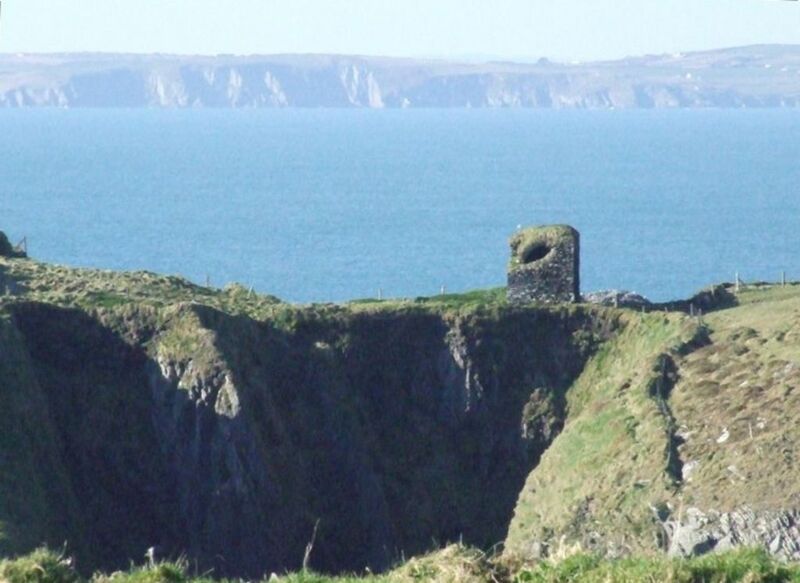 The walks along our headland are absolutely incredible, with a 17th century watch tower, a secluded cove and a salt tower among it's delights. The surrounding countryside is dotted with small colourful towns and villages, which provide a range of food from irish pub grub to high restaurant quality standard. Clonakilty, the home of Michael Collins, is just seven miles from the cottage and has a wide variety of delicious restaurants and, in particular, a traditional Irish pub where many renowned bands play, De Barra's. There is also the spoiling Incheydoney Spa with an indoor sea water pool and a thalassic health spa. Bandon and Lisselan offer great golf clubs - Bandon (18 holes) and Lisselan (six holes). Bandon also offers fishing on the sea trout and salmon river, day passes are available. Kilcoleman fishery is well worth the day. You can follow the Wild Atlantic Way from Dunworley to Kinsale for a stunning drive. Be it during the day for some sightseeing (from 17th century forts to rugged walks along the headlands Kinsale is a haven for tourists) or by night for an uplifting irish experience, lively pubs host some excellent bands. Courtmacsherry is another beautiful harbour town, just 5 miles away and has sailing, riding, sea fishing, and windsurfing facilities along the beautiful strand. Barryroe Co-Op is the nearest shop, 2.5 miles away. And the nearest pub is 1.5 miles away. I own a small holding in West Cork which I farm organically. I have two cottages on the land which I rent out. Dunworley is somewhere that we used to visit a lot, being the most beautiful beach in Ireland! The property used to be the famous organic restaurant, Dunworley Cottage Restaurant, where we we would often eat. When it came on the market we fell in love and moved here with our family to start out own organic small holding. We couldn't resist having the most breathtaking vistas on our doorstep! You can have a delicious gourmet dinner cooked by a professional chef. Incomparable walks on the Seven Heads Peninsula (on the Wild Atlantic Way) with incredible views. Calls to landlines in both Ireland and England provided free of charge from the cottage's phone. You can have dinner served to you in your own dining area- just speak to Gilly when enquiring. There are 2 gardens for your use: The first has a tall fence surrounding it for privacy & is perfect for relaxing outside. The second is below the balcony & has a clothes line for your use. The balcony outside the triple bedroom overlooks Gilly's beautiful vegetable garden & beyond that, the undulating hills of Dunworley. We have delicious, organically grown seasonal fruit , vegetables, free range eggs, pickles , jams etc which are all available for purchase! They make great presents for those you've left at home! Amazing views. Nice neighbours. Easy access to the beach. Pillows and duvets were wonderful! A great place and great hospitality by the Murphy's. Wonderful cottage and hosts! We stayed here for 2 weeks in October and loved every minute. We look forward to returning one day soon. The views from every window were amazingly picturesque. It was quaint but had every convenience.